Hi Ben! Welcome to the Community! It looks like subscripts and superscripts aren't supported in Markdown, based on what I read in the Markdown resource linked in the article. Hi trying to add our company address to the signature which has a suite as #201. Of course Markdown wants to make this a link to a ticket. Is there an easy way to take away the formatting just in this one instance? Backslash should escape that character out. So it would be one \ followed by #200 "\#200"
Is there an option for escaping Markdown when it's enabled? I see we can escape the links created by the hash with a backslash, but can this be done somehow for, say, numbered or bulleted lists? Any reason that this useful markdown is not documented? Anybody know how to add a URL for phone numbers? I am trying to add a phone number to our signature and I want it to be clickable. HTML doesn't seem to work. What do you want to happen when someone clicks on that phone number? Do you anticipate that they'll be using it from mobile? Yes, the goal is that someone on mobile could click the link to open their phone app. In the limited mobile dev experience I have, if you add a hyperlink in the format: "tel:+18001234567" almost all mobile OSs know to open that number in the default phone app. And when a desktop user clicks the link it will just open their browser with "tel:+18001234567" in the URL, and for Macs it offers to open FaceTime. Does Markdown work in Dynamic Content as well or just tickets? Please let us know if you other questions or concerns. How do you create the nifty yellow-colored boxes around your "Note" text call-outs? I'm currently in charge of building out my company's new repository site using the Zendesk Knowledge Base, and being able to call out important / significant information by enclosing it in a highlighted box would be a fantastic improvement over how we emphasize text on our old site. I'm assuming this is an HTML tag, not a markdown syntax, but I've been unable to figure out how to accomplish this. Any pointers? Thanks for the info Nicole! You're welcome! Let us know if you have any additional questions. To the best of my knowledge, the ability to highlight isn't actually possible in Markdown. The closest you can get would be to use three backticks ( ` ) to put that information in an inline code block. @Ryan - FWIW this is one of the main reasons we use HTML email with Zen (and the fact that I personally use a screen reader, which is poor when reading text boxes on Web Forms). I created a style in Outlook that mimics the code block in Zen, but of course you can highlight what you want. The only issue I have found is that Zen does not respect the font selection. I chose a mono spaced font (Courier), but Zen replaces this with a normal font. Zen is not the best at formatting for Outlook, which is unfortunate as this is the most widely use business email client on the planet. Even if it might not follow standards very well, it should be specially catered for. IMHO. However, this is mainly OK.
You might want to consider adding a note to the top of this support article in the bulleted list of where you can use markdown that if rich content is enabled, you cannot use Markdown in macros as specified here: https://support.zendesk.com/hc/en-us/articles/203661586-Enabling-formatting-options-for-agents. I had tried to use Markdown based on this support article and had to figure out why it would not work. Hi Jamie, thanks so much for this great feedback! I've made a few updates to the article to include it. Rob, while you're tweaking -- long missing from this article is the explicit instruction to include blank lines before and after bullet lists / numbered lists / code blocks. My infrequently-using light agents are often tripped by this (since many markdown flavors do not have this requirement.) Thanks! Now *that* is fast turnaround -- thanks, Rob! 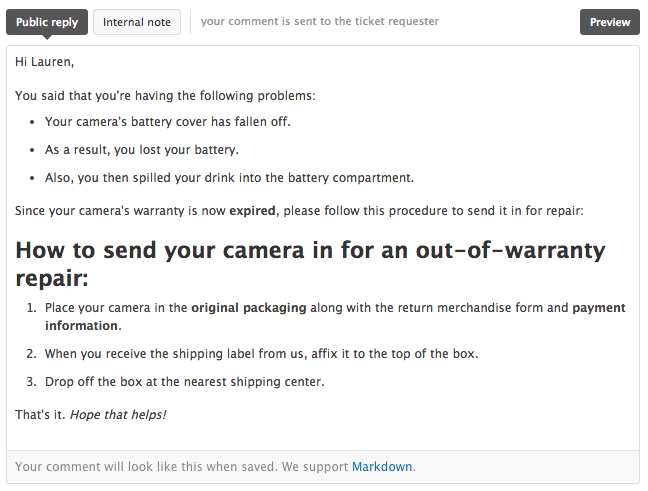 It doesn't appear the markdown code works in the "CC Email Text" found under Admin > Settings > Tickets > CC email text. Am I missing something, is there any way to add some formatting to this email to liven it up a bit? I found the answer to my own question here in the comment section. It looks like you just have to use traditional html mark up (<b>, <u>, <i>, etc) which is actually much easier than markdown IMHO so that is great news. AND this works in triggers auto emails too which I didn't know and thought those were limited to plain text. Big win for us to find this! Thanks for letting us know you found the answer and glad to hear you're happy with the solution! We'll update this article to add where you can't use markdown, as we currently only document in this article where you can use markdown. How can I remove markdown from text. For example sometimes cutting and pasting from other sources results in unwanted formatting and a clear format button would be very useful. 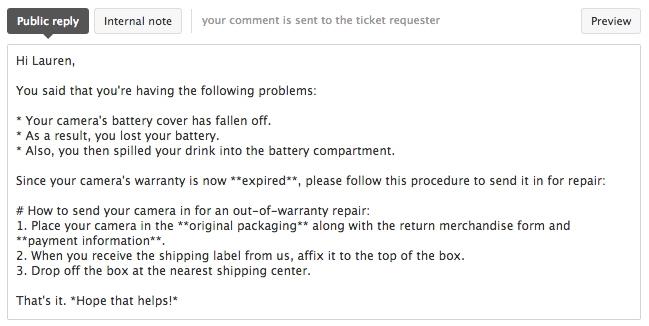 Where are you pasting this text in Zendesk? In most cases you can right click or control+click on the text box and select Paste and Match Style to paste the text without any additional formatting carrying over. Have you given that a try? Hi Jessie. It could be from anywhere - a snippet from webpage, word, pdf etc. There might not be a style to match it to but I'd just like to remove any formatting that has been applied to it. Same could go for text typed directly into the response and formatted using the WYSIWYG editor with multiple different styles which you want to undo for whatever reason.